Here are a few things to note before your big trip to this tropical city. This is a shortlist, but very important nonetheless. I traveled to Singapore some time ago and I was impressed with my visit there. Everyone was super nice, everything was in English and easy to find. I learned a few things along the way, I want to share with you. 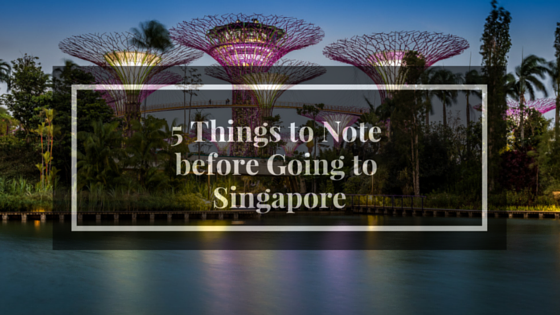 Hopefully, they will be helpful for your trip to Singapore. If you like chewing gum, then you would forgo chewing gum in Singapore because it is illegal. It is not even sold in the shops there. Spitting on the pavement, in the bushes or out of your car window is illegal, as well. Also, do not litter. That should go without saying, but it is illegal in Singapore. Opt to take the train or local buses as often as possible because taxis is very expensive. I was lucky to have friends living there with a car, but whenever I could I would walk or take the train. The train system is called MRT. With only five lines and everything written in English you will get around with ease. Click here to see a map. It is very easy meeting new people in Singapore. I remember telling my friends, that it was raining men in Singapore. But it is important to note, I was living in Korea at the time and men here were slim pickings. Men be on the lookout for prostitutes. They are laced in with regular patrons at some of the most popular clubs, waiting for an unsuspecting tourist to pick-up. I will not name, which clubs, but they are there. If that's your mojo, then no judgement. Singapore is very safe, if not one of the safest country's in the world, but don't go walking around in a dark alley at night. Normal precautions should be taken wherever you travel. Budget, budget, budget! Everything is expensive in Singapore, so please make a budget and stick to it. I didn't budget,while I was there and I have no regrets. Thanks my friends I had a place to stay and food to eat at least twice a day. We usually go out for dinner. Alcohol will eat up all your money if you are not careful because alcohol is super expensive. The funny thing is that many locals head to Malaysia to stock up on alcohol and sometimes groceries, both are way cheaper there.